Mangrove swamps are facing a lot of dangerous the world over. They are being removed to make room for development, the wood is used for construction and firewood and are being destroyed to make room for shrimp farms and other aqua culture ventures. Nearly 35 % of all mangrove Forrest have already been destroyed. This number is lower in Central America but it is still time to stop the destruction and start reforestation projects. Shrimp farming and growing beach communities are the biggest dangers to the mangrove in central America. Illegal logging for firewood is also a serious problem as the firewood gets transported into the larger cities. The logging for local use can be sustainable but the market for cheap firewood in the city is too high for it to be sustainable and the poor loggers try to harvest and sell as much a possible. This is causing massive damage in some area in central America. Mangrove Forrest is essential for the entire coastal environment. 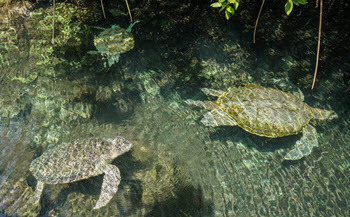 The mangroves are home fro a large number of species of crabs, crocodiles, turtles and sea turtles. They are also an important nursery for a long row of different marine species. Healthy mangroves is due to their role as nurseries very important for the fishing industry. The populations of many commercially important species such as snook and snapper will become a lot less resilient if they lose their nurseries. Their young can survive in open water but will have a lot lower survival rates if there is no mangroves present in the area. This is due to the fact that the mangrove roots offer protection from larger fish and other predators. The mangroves is also very rich in nutrients and allow the fish to eat well and grow quickly. The Mangrove forest also plays a very important role of cleaning the water that flows out into the ocean through the river and streams that meanders their way to the sea. Mangroves are very good at removing reduce nitrates and other nutrients out of the water that runs out in the ocean. Red Mangrove (Rhizophora mangle) is often used in sumps to help keep the water clean in reef aquariums and other marine aquariums. The nutrients that the mangrove trees remove from the water running out in the ocean help prevent algae blooms on the reefs. Algae blooms that easily can be trigger after heavy rainfall when the rivers bring a lot of nutrients from the inland. These algae blooms can be very damaging for corals, sea fans and other creatures on the coral reef. A healthy mangrove forest is hence an important factor in a healthy coral reef outside it. Luckily the importance of mangrove forests are becoming more more well known and we can see more and more projects designed to protect, rejuvenate and even replant mangrove forest. This includes projects run by large NGOs as well as small grass roots projects. The small projects that have support by the local population and fishermen are often the most successful projects. It is important that the locals understand the economical importance of the mangroves for a project to be successful. If the locals know that the forest is worth more to them in pristine condition than it as firewood than they will become a part of the solution instead of a part of the problem. Examples of grass projects that have local support cam be found in an increasing number of places. A few examples includes Las Penitas (Nicaragua), Trinidad and Tobago and Bimini and Great Ghana Cay in the Bahamas. Can Ecological investing save the world?